Lemon Cake Jello Shots taste like cake! 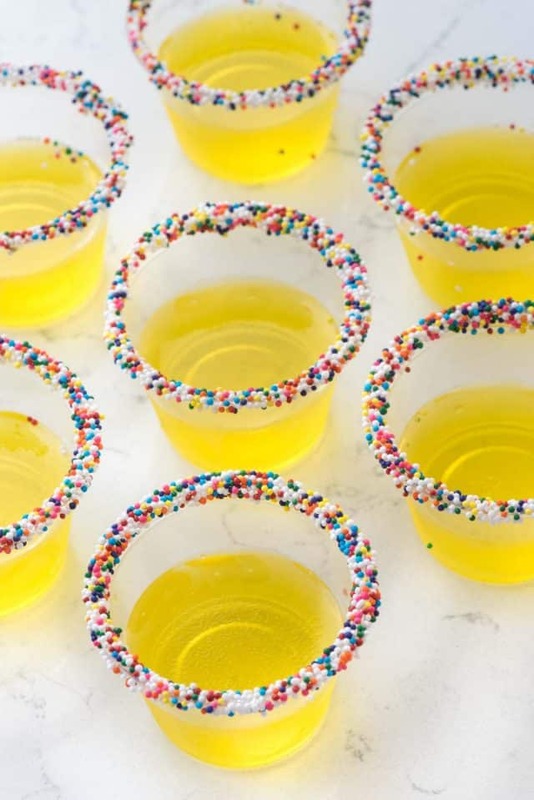 This classic Jello shot recipe gets a twist with cake vodka and sprinkles for the perfect party shot! I went to a small Catholic university that had no fraternities or sororities, and I lived at home. Most of my college parties were from when I visited my boyfriend at UC Davis every other weekend. I don’t know if you ever visited a boy apartment or frat house…but I avoided kitchens and bathrooms as much as I possibly could. College boys are…gross. Maybe I’d never thought to make jello shots because I’m not a fan of jello? It’s a texture thing…but I need to get over that because, hello, alcohol. Specifically in these, cake vodka. These lemon jello shots aren’t just your mom’s 70s jello shots, uh-uh. 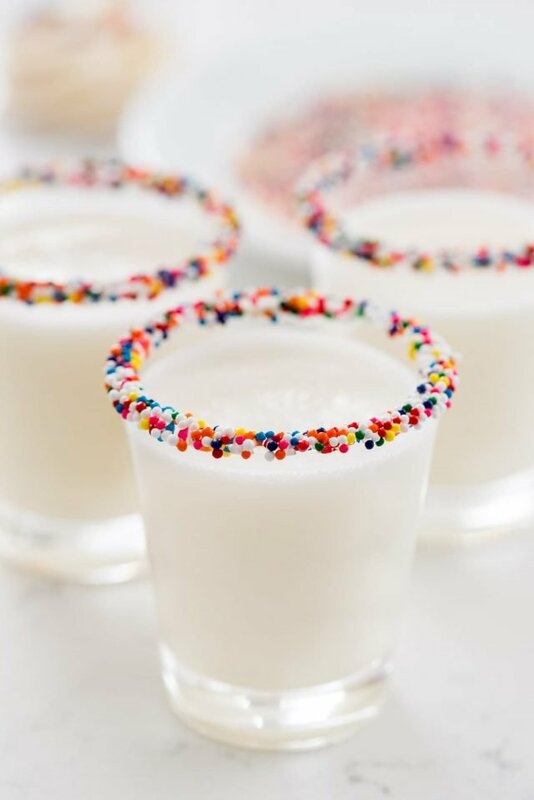 They’re full of CAKE vodka so they taste like a lemon cupcake…with a sprinkled rim, of course. I made these for a 50th birthday party back in September. The birthday girl loves sweet drinks (in fact, my frosting shots and lemon cupcake martini are a few of her favorites), so when brainstorming cocktail and dessert ideas I thought, why not try jello shots? Guys, they were a HIT. If you are throwing a party (like, say for New Year’s?) 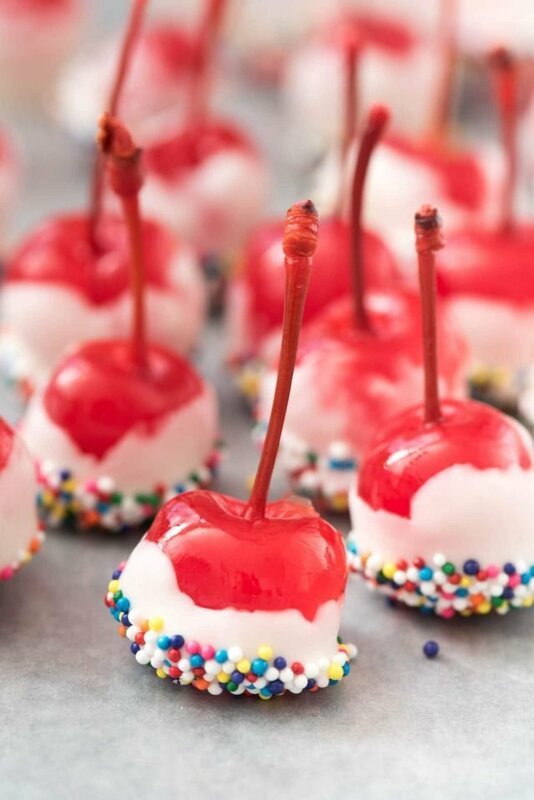 they’re the perfect dessert cocktail for you to serve. Dessert + drink in one, who can say no to that? 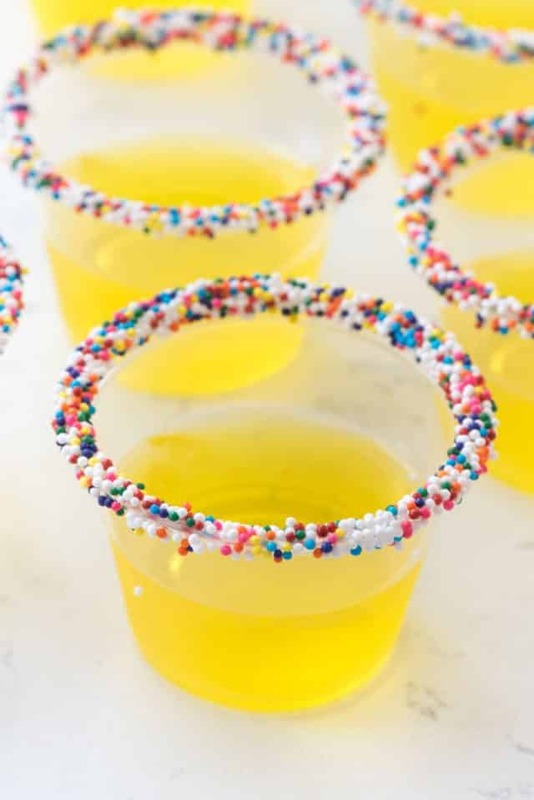 Lemon Cake Jello Shots are the perfect dessert cocktail jello shot infused with cake vodka! Start with your favorite flavor jello. I think you could get away with adding cake vodka to most flavors of jello, so if you don’t have lemon, use your favorite. If you don’t like cake vodka, use your favorite. I intend to make this with every flavor alcohol I can! You can use reusable shot glasses, but I love using these disposable jello shot cups for easy cleanup. 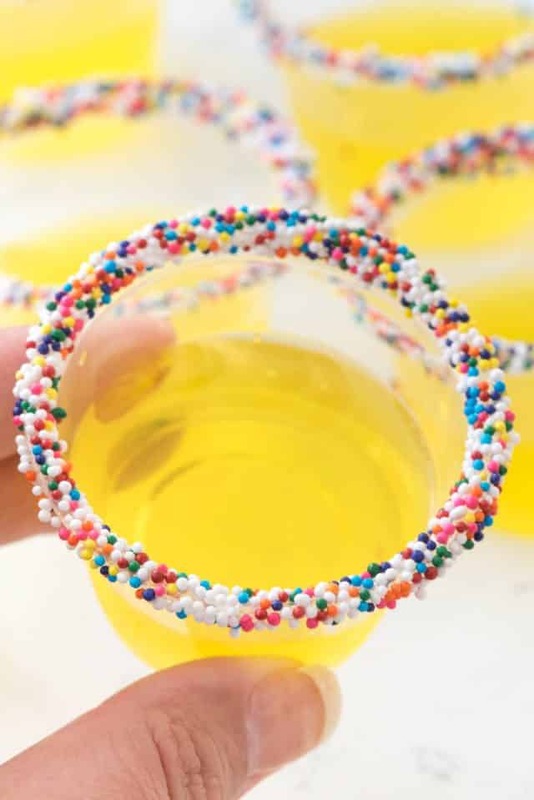 To rim the glasses with sprinkles, dip them in corn syrup or honey and then in nonpareils. They make them look way more festive! To rim glasses/cups with sprinkles: dip each glass upside down in a bit of corn syrup or honey, then dip in sprinkles. Stir together jell-o and boiling water until powder is dissolved. Whisk in vodka and cold water. Pour into one ounce cups or shot glasses. Chill until set, at least 3 hours. They'll last overnight or a few days in the refrigerator. Check out my lemon cupcake martini for another lemon flavored drink! Or try Watermelon Jello Shots by Amanda’s Cookin’, Strawberry Champagne Jello Shots by Pint Sized Baker, or Kahlua Coffee Jello Shots by Mama Loves Food! I can see how these would have been a party hit! And college boys (or sometimes much older) are pretty gross when it comes to kitchen and bathrooms, totally agreed; avoid like the plague! lol Merry Christmas! Like getting tipsy on sunshine! Perfect for these dark winter days! These are fabulous! A total party in my mouth!